The year was 1984 and I was a high school junior. I'd heard of Rocky Horror but had never been. I knew all the words to The Time Warp, having heard it innumerable times on The Dr. Demento Show, but had no idea where it came from. Then, one fateful weekend, I asked my friend Lola what we were doing that evening. We were in the car and well down the road before she said we were going to see Rocky, something I had, until then, really not been keen to do. Sue me, I had no idea. But after that first show, I was hooked. From then on, I spent every weekend making the 20-minute drive to the show. I honestly can't remember much about the cast, probably because I didn't have anything to compare them with. After about a year, my friends and I started going to the show in Santa Barbara, California, an hour's drive, but very much worth it. The crowd was larger and the cast, if you could call it that, made up in enthusiasm what they lacked in showmanship. There was no stage and most cast members tried to put together a costume, generally only getting "close." But everyone was fully into it and really, that's more than half the battle. For many years we made the trip, saw the show, and made 2am trips to the Denny's-like place for country gravy on fries, Rocky Romances and "it's too late to drive all the way home"misadventures. I was anticipating that the audience would be mostly virgins. The audience was mostly inexperienced, but there were plenty of fans and, to my surprise and happiness, a cast! As with any college, people came from all over, and of course some were Rocky fans. How they found each other and put together a cast, I never found out. The show was a lot of fun, though, and afterwards I went up to the Columbia and thanked her for the show. After a quick exchange of bona-fides she invited me to the cast party where we realized that we both came from many years of Rocky fandom. On that night, the idea for the Zen Room cast was born. We gathered the troops, did some research, and a few months later marched down to the university's student affairs office (Hello, Sir, I'd like an affair please) and filed the paperwork forming an official student club. We recruited cast and crew, set some dates, booked the film through the university's purchasing office, and promoted the shows. Rehearsals were in the parking lot at "Earth Orbit," an apartment complex almost completely filled with our group of friends, where we painted the outline of the stage in the asphalt and put down tape for blocking. Communication was almost completely electronic - this was in the early 90's, before the World Wide Web. We communicated via newsgroups on Usenet and email. Since everyone was online, we kept in touch constantly and, since nobody had heard of the Internet outside of the school, our ability to coordinate seemed superhuman and magical. We weren't just Rocky fans, we were nerdlike Rocky fans. In the early 90's, we did two shows per quarter to the tune of 700 tickets sold (typically 250 or so for the early show and the rest for the late show), filling a university auditorium. After a few years, we moved into the Cal Poly Theatre, where we were able to perform on an actual stage. It makes a difference. Instead of a large room in which they put up a screen we had access to a real stage; dressing rooms with makeup tables and mirrors; props storage; and stage rigging to put on what, without the movie, would have been dangerously close to a staging of The Rocky Horror Show. Continuing once a quarter, we often sold out the 500-seat theater. When I started performing with Zen Room, I knew that a lot of my time would be spent helping run the show. 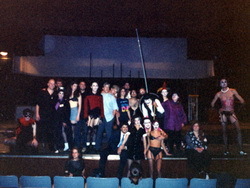 I regularly acted as the show's MC and then performed as Crim, which allowed me to perform as well as manage. A side benefit of being Crim is that one is uniquely positioned to assist with pranks. There was no conflict in ensuring, for example, that a large tub of Crisco was in the right place at the right time... It was tradition that our Eddie acted as the windshield wipers for Brad and Janet's car. This frequently resulted in "Plumber's crack" during this scene, and one show we decided that crack needed to be patched. With Crisco as the spackle. In 1996, we decided it was time to use our superpowers for good, and we put on a two-show night where we boosted the ticket price a couple extra dollars and donated 100% of our profits to the San Luis Obispo AIDS Network. We called the night "Science Fiction Double Feature" and, at least for me, it marked the highlight of my time with Zen Room. That show also marked a pivotal time in my life as well. I had been dating our cast makeup artist, Lisa, for only three weeks when we realized we would be short a Trixie for the benefit show. I thought to myself, "Ask her to do Trixie. If she runs away screaming, you dodged yourself a bullet." She didn't run away, and I knew I had a keeper. One year later, she became my wife. Alas, all good things come to an end, and in 1997 I left San Luis Obispo, recruited by Microsoft to bail Bill Gates out of a jam. I moved to Seattle and found that I didn't have much time for Rocky while turning into a member of the Borg Collective. Over the next 13 years I attended many shows, mostly in the Puget Sound area, Oregon and all over California while visiting friends. I returned for visits to San Luis Obispo a few times for Zen Room performances, but my Rocky activity was nowhere near what it had been. That is, until late 2010 when I realized that a company I had started, Insider House, was uniquely positioned to test our new social media platform on a community I held near and dear. Insider House had developed a web-based social platform for the community of amateur photographers and models and wanted to expand to other groups. We decided to expand into communities where we also played, so we would know people and ensure that we did right by the community. Rocky Horror seemed a perfect place to play, so I dropped an email to Larry Viezel, who I knew from years and years of online Rocky Horror activity (remember Usenet? Alt.Cult-Films.Rocky-Horror for the win). I told him what we wanted to do, and he mentioned two things. 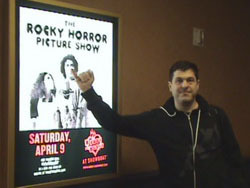 First, he had the RockyHorror.org domain which would be a good fit and second, he was putting on the 4/7/11 convention in Atlantic City - could we have it all ready by then and show up to roll it out? Three months. For a six month project. *Blink* Um. sure, we can do that. And we did, thanks perhaps to my skills in whip-cracking, outright bribery and willingness to put in 80 hour work weeks. 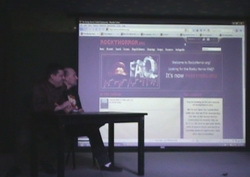 Larry also hosted the Rocky Horror FAQ with Ruth Fink-Winter, so we contacted her and converted the FAQ over into a Media Wiki, creating RockyPedia.org. For good measure we debuted a Facebook presence (http://www.facebook.com/rockypedia.org). We attended 4/7/11 to launch the site and I quickly remembered what I missed about the community. To say it was one of the best vacations I've had in a long time would be an understatement. Now, two years later, we're preparing for our first major upgrade (it's in testing this April and we expect to roll it out this summer). Facebook.com/rockypedia.org has over 25,000 fans and has been leveraged to help casts and theaters in their times of need, promote shows and Rocky fandom, and bring in new fans. And, of course, I and the rest of the RockyHorror.org/RockyPedia.org team do it because we love it. In the past two years we've visited casts around the country, made a ton of new friends, and come up with more good ideas than we'll ever have time to implement. I can't imagine letting my involvement in Rocky fandom lapse again!